Maple Leaf Up is a personal project that started over fifteen years ago to capture the voices of Canada's WW2 veterans before they are silenced. MLU requires dedicated and committed individuals to bring you this content, but it also requires, as you might imagine, money — for research, travel, video production, equipment rental, illustrations, graphics, web design. 1) Consider purchasing MLU t-shirts and other merchandise through our Shop. 2) Consider a Donation through PayPal. 3) We need skilled volunteers, especially illustrators, graphic designers, web designers. 5) We need researchers — in places we can't access all the time. For instance, Ottawa, Halifax, St. John's, North Nova Scotia, North Shore New Brunswick — all across Canada. And Europe too! 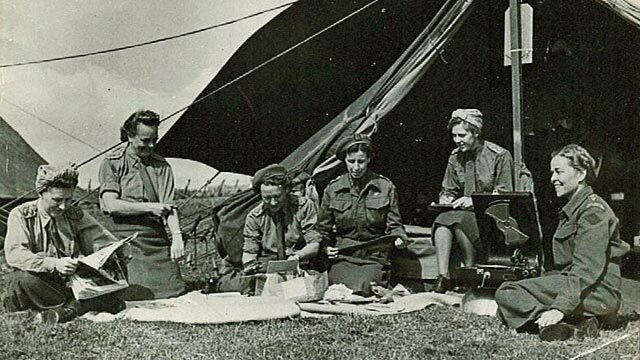 Canadian nurses from Casualty Clearing Station #2 in Normandy.